System values are values assigned dynamically by the Boomi Flow engine during runtime, and include information about the flow, the person who starts the flow, users in the flow, geolocation data of the user, etc. System values are different for each flow, and not explicitly created unless the flow asks for it. We will therefore not find system values by clicking on Home, and Values. If we are building a flow, and need to see the data contained in a system value, here is a quick tip on how to create a flow with a Step element containing the value, and run the flow to display the data of the value. Drag a Step element from the left-hand-side navigation, to the Boomi Flow Canvas. This opens a configuration panel on the right. Enter a name for the Step in the Name field in the Configuration Panel. Click Insert Value. 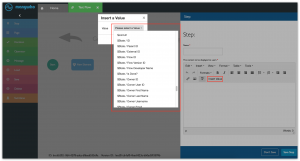 This opens the Insert a Value dialog box, with a scroll-down list of all the available system values. Select the system value you want to see and click Ok. Drag an arrow from Start to the Step you have created. In the Configuration Panel, type Go in the Name field, and click Save Outcome. Run the flow by clicking the Play icon on the right-hand-side navigation. This runs the flow in a new browser tab, with the data from the system value displayed on the screen.